Copy the text below, and paste it into your fave site. Copy the text below, and paste it into your website. Bacup Sunbed Hire allows you to tan in the comfort of your own home. Our Sunbeds all conform to British standards and are retubed often. (We retube at 300 hours) to keep peak operating performance. All of our Sunbeds are 240/250watt, but don't be fooled by this number as wattage is simply a measure of electrical power, and electrical power does not tan you. Think of this number as a more reliable wiring loom/uprated components within a Sunbed. Others use wattage as 'Sales patter' which is unfair for those who don't understand. Delivery and Goggles are included in our prices and we cover Accrington, Altham, Bacup, Barnoldswick, Barrowford, Baxenden, Blackburn, Brierfield, Burnley, Colne, Crawshawbooth, Earby, Fence, Great Harwood, Hapton, Higham, Nelson, Oswaldtwistle, Padiham, Read, Rossendale, Todmorden, Trawden, Worsthorne. Below are the recommended maximum tanning times for our home hire Sunbeds (Per side foldaway / Total Stand up). We will of course advise you with further details upon delivery. We can also provide advice for any skin conditions and treatments. Our Fold Away Sunbed Hire. 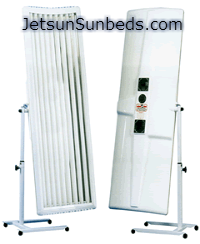 Sunbeds which operate over your bed and fold away when not in use. Our units feature 9 RUVA fast tan tubes and facial tubes. 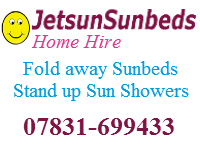 Our Stand up Sunbed Hire. 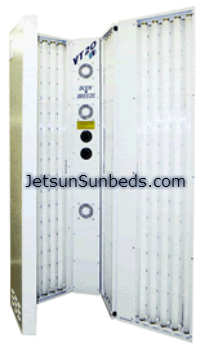 Sunbeds which are set up as a stand alone unit, featuring 24 RUVA fast tan tubes and 4 facial tubes. Our sun showers completely enclose you with a door which also has tubes within it unlike many others.